Monster Party: It’s a Monster Birthday Bash. 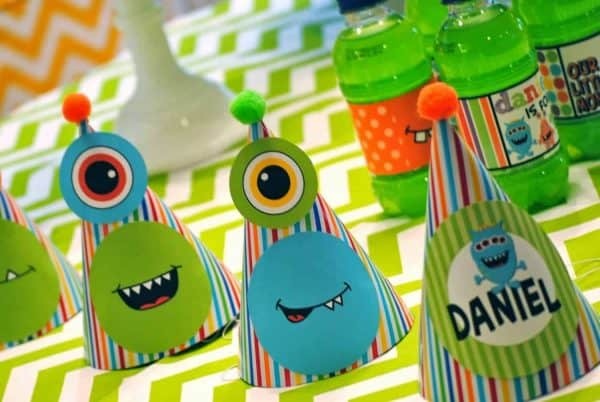 Long for some super cute ideas for a monster birthday party? 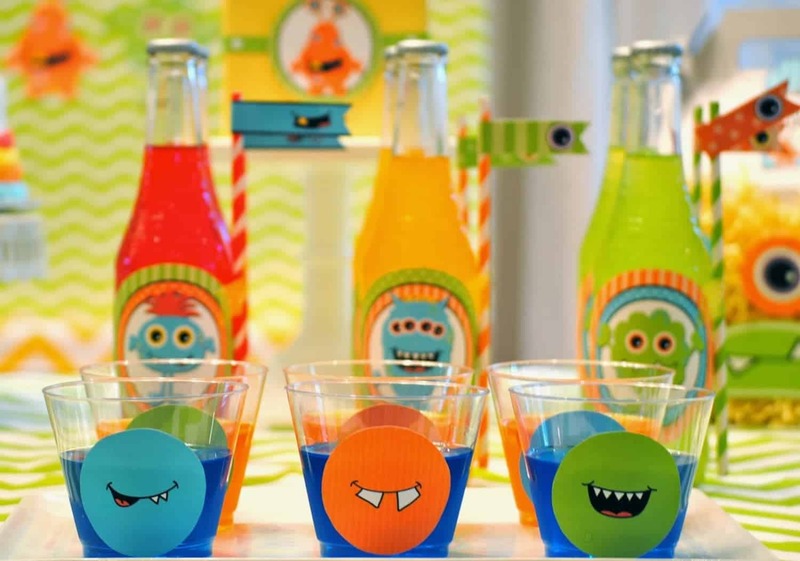 Want a way to celebrate your little monster in style? 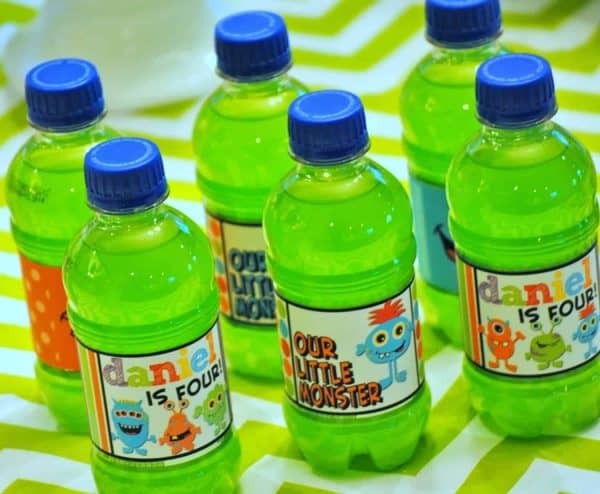 I have a monster-rific party to share today. 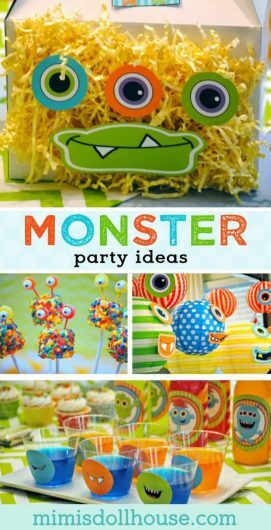 Be sure to check out all our Monster Parties ideas and inspiration. 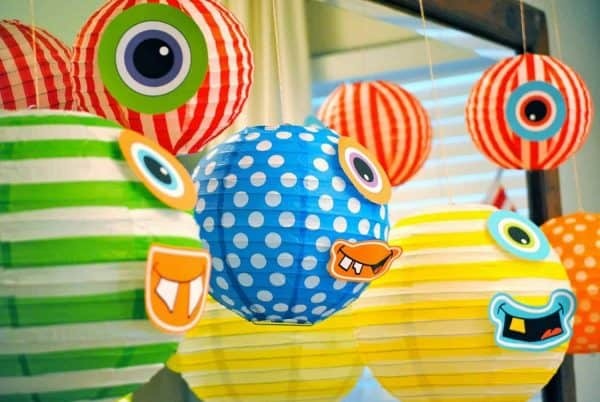 The mouth and eye cut outs on the paper lanterns is such a great idea…I love it!! 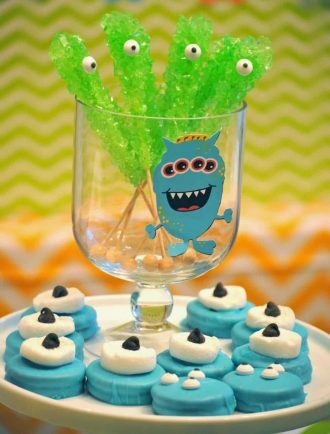 I love the monster jello cups too. Adorable!! 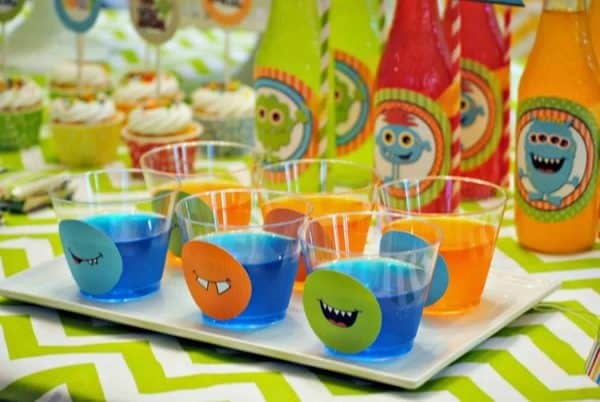 I love the idea of pre-portioning out things like jello…it’s so much easier to serve and makes for a neat table! Wanna throw a Monster Party? 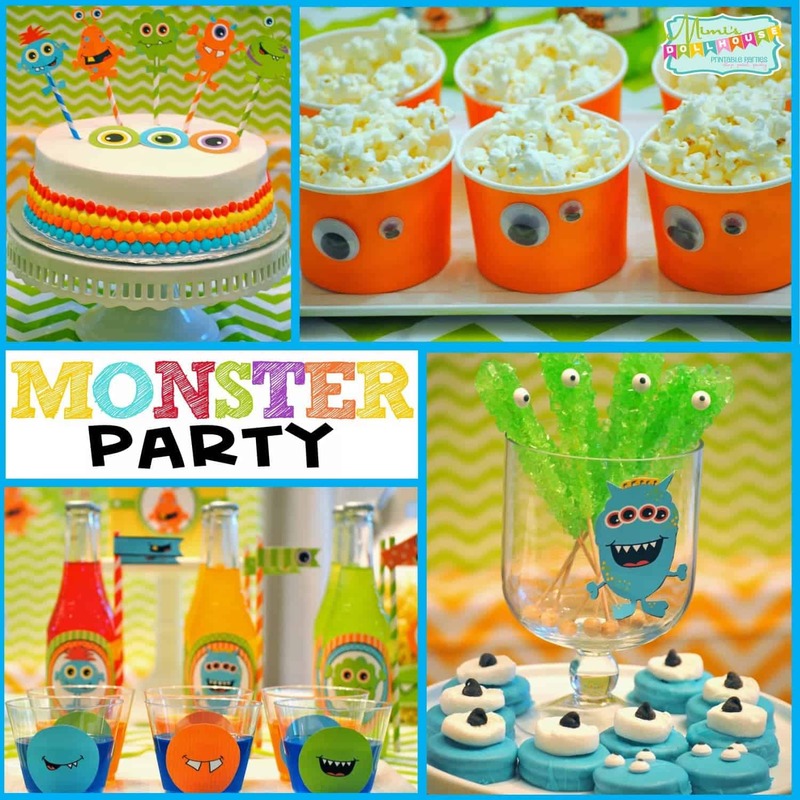 Cutest monster party ever! And those marshmallow pops? Adorable! I wish I would have had something this cute when my son turned 1 years back. 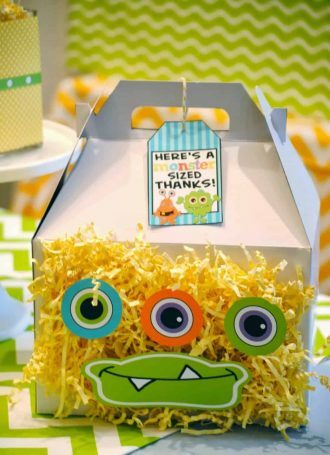 This is adorable and would have totally fit his littler monster personality! This is too cute! My favorites are the marshmallows and the monster lantern. I know myself, I can not match greens to save my life when shopping two different times – of course you’ve handled that one for me! This is the cutest and soooo detailed! What a fun party! Let me add that I somehow didn’t realize you could buy the printable party decor!!! I am super excited I found this! I am sooo following on Pinterest! Wow, where were you when my kid was growing up…he’s a big monster now..lol! This is too cute! Oh my gosh, this is so cute! I’m sure Daniel had a terirific party! Oh my goodness! These are just precious! 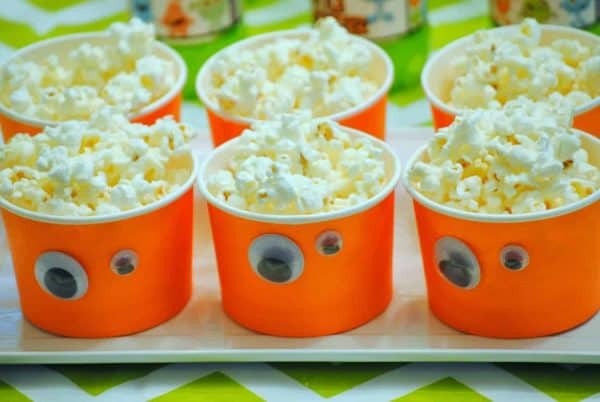 I especially love the marshmallow sticks and the popcorn bowls! 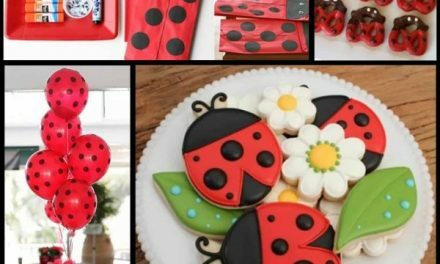 This is so cute and looks like one I could actually do that wouldn’t turn into a gian Pinterest fail. 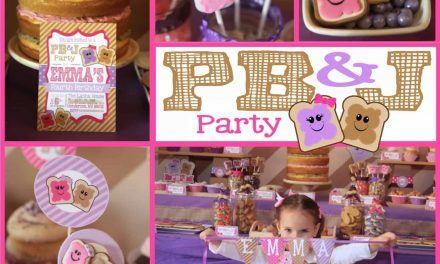 This is an adorable party theme! 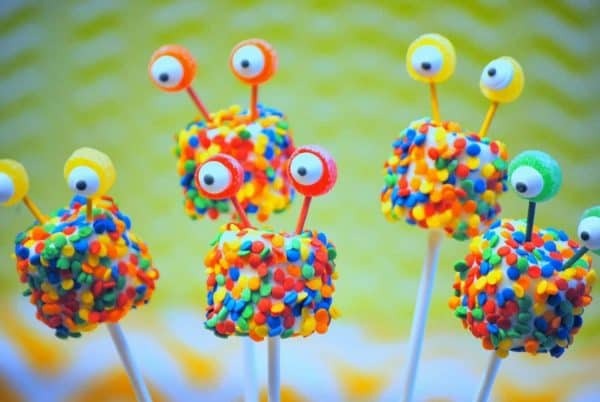 I love the marshmallow pops! Great job! I absolutely love this color scheme! I can’t wait to surprise my kids with the marshmallow pop. 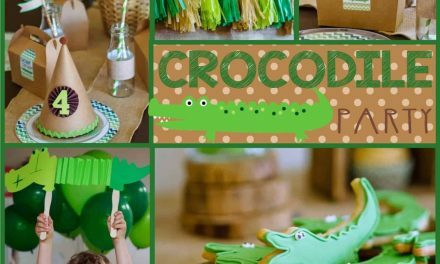 Super cute party ideas! 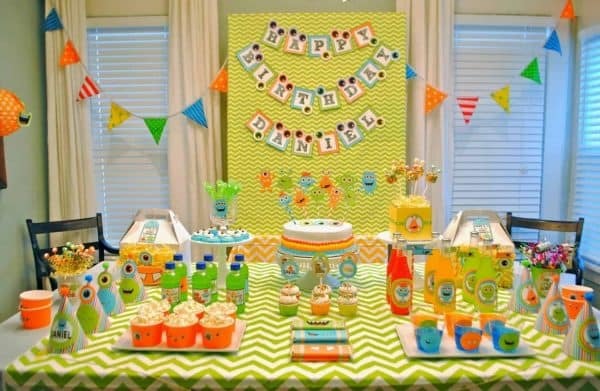 This is the cutest party setup ever! 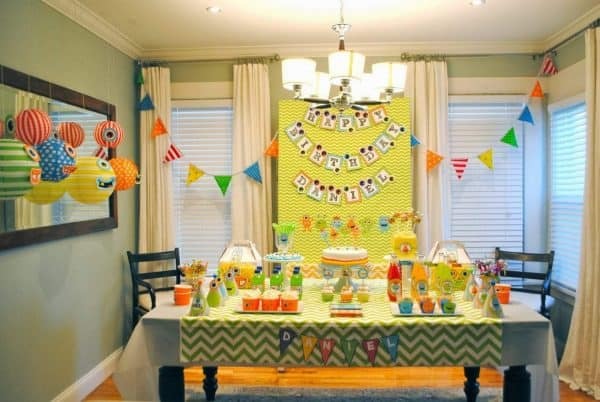 Love it so much:) Any kid would love this party theme! 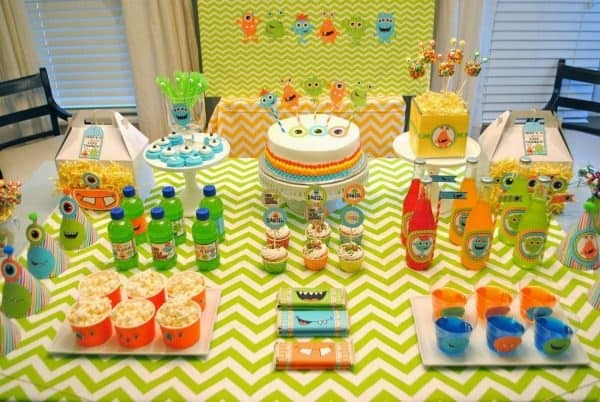 This is a cute party set up. 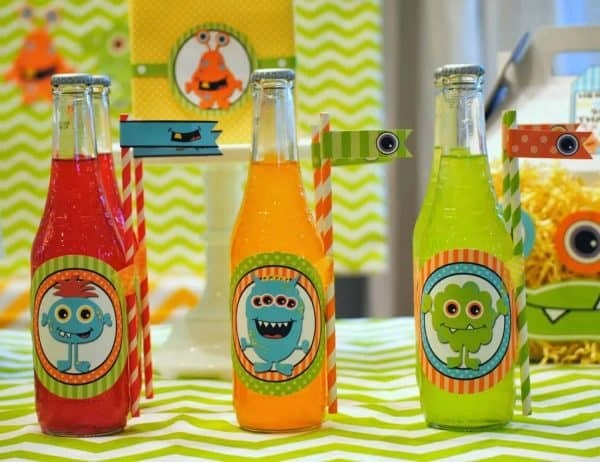 Typically, I am not a fan of monster-themed parties, but this is a wonderful gender-neutral party idea. You executed it beautifully. I just bookmarked this for later. 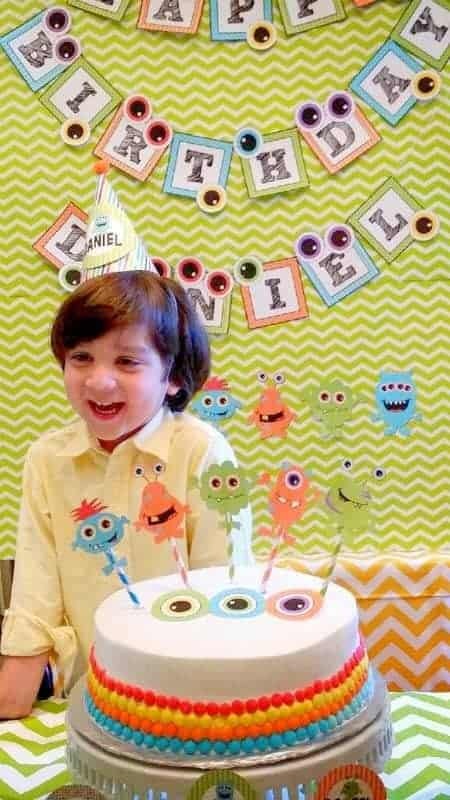 My son’s birthday is coming up and he loves monsters. I’ll have to use some of these items. 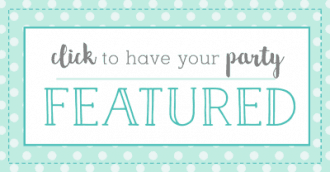 These ideas are all so stinking cute! I can’t choose just one favorite. And I love that the decorations are all super simple too. Super cute!! This must have taken forever to put together. 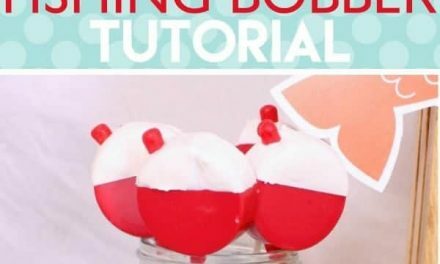 I did a The Little Mermaid themed party for my little one’s first birthday, and it would have been SOOOOO nice to have something like this to just download, print, and place. 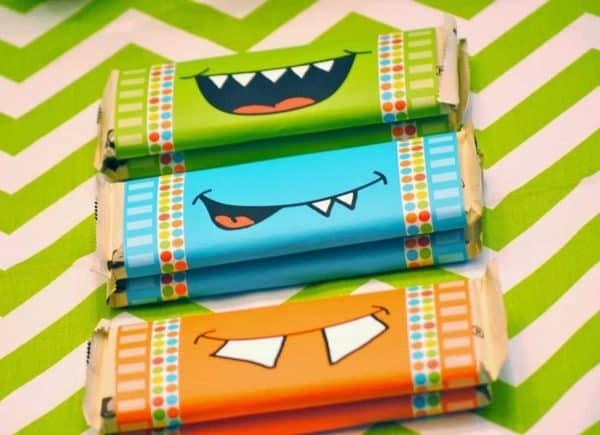 This is the cutest idea! Lots of sugar, but then again it is a party ? So cute!! Definitely a Pinterest worthy theme ? I am totally in love with this theme! 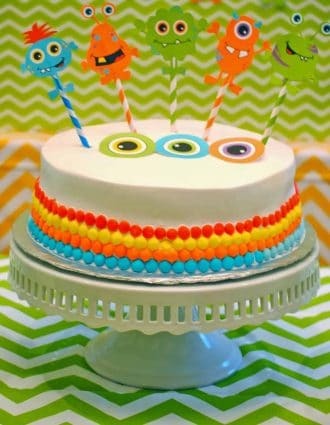 I tried to do one for my son’s 3rd birthday but it wasn’t this cute. Awesome idea with the marshmallows! I really enjoy all of these decorations. You did a great job. 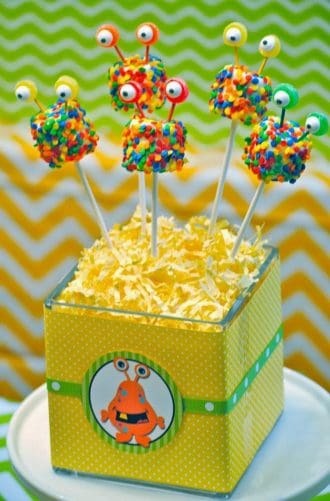 The cake pops are the best! I wanna throw a monster party! So cute! My niece is turning four next month and I will suggest this idea to my sister. Thank you! This is so incredibly cute!! I’m pinning this now!! Aww these are such cute ideas! 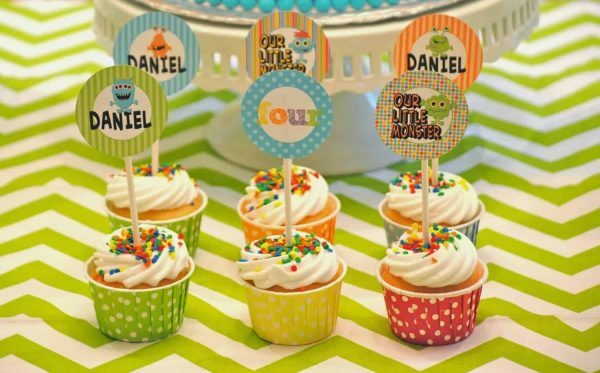 This an absolutely adorable birthday party theme! !